Home / Fast Food / Float / Jollibee / Products / Jollibee's NEW FLOAT? Jollibee Floats, Jollibee’s cool new beverages that is guaranteed to let teens experience a delightfully refreshing lift this summer! The Jollibee New Float comes in Coca-cola Float or a new fruity twist through the Watermelon Sprite Float! 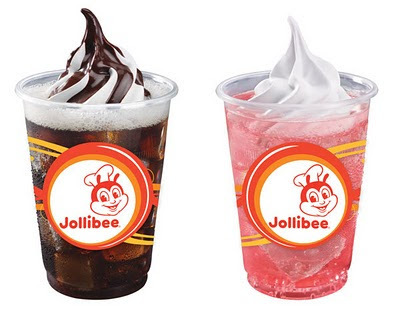 Jollibee’s new refreshing soda treats are topped with indulgent swirls of vanilla soft-serve and come in two variants. The Jollibee Coke Float is a frothy combination of the all-time favorite Coca-cola and creamy vanilla soft-serve and decadent chocolate syrup, just right for fun times with the barkada. Friends looking for a fruity twist to the classic float can delight in the Jollibee Watermelon Sprite Float. Offering a mix of Sprite, soft-serve and delicious watermelon syrup, the Jollibee Watermelon Sprite Float can double as the perfect fruity drink to complete the langhap-sarap dining experience with friends. Pricing for these floats are at Php25.00 for the Coke Float and Php28.00 for the Watermelon Sprite Float. Well it's comparatively priced against the McDonald's Coke Float and IMO, MCDO Coke Float is still Better. I have personally not yet tried the watermelon one but just to compare the Coke Float, the Vanilla Ice Cream's consistency is different from McDonald's and that somehow the hot fudge sticks to the Ice Cream more than that of Jollibee's (Which the Fudge just fell down as I tried sucking on it or that's just me noticing these things).